Government adviser Sir Roger Scruton has been sacked over comments about Islamophobia and homosexuality. The adviser was dismissed as a housing tsar with immediate effect, the Ministry of Housing, Communities and Local Government confirmed. Sir Roger came under renewed criticism after commenting on the controversy, as The New Statesman America quoted Sir Roger as repeating his claim that Islamophobia was a propaganda word "invented by the Muslim Brotherhood in order to stop discussion of a major issue". 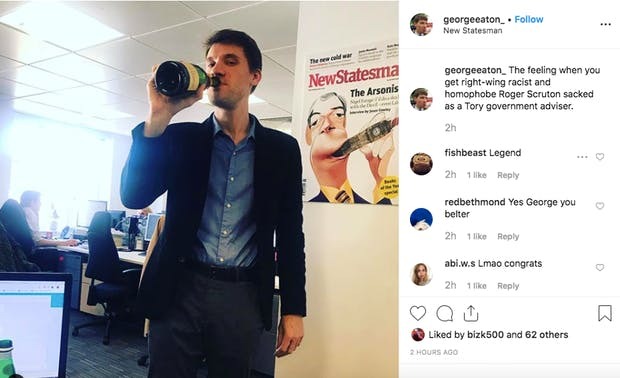 The interview was conducted by New Statesman’s deputy editor George Eaton, who after Sir Roger was sacked, posted a photo to Instagram of him drinking champagne from the bottle. Columnist Douglas Murray defended Mr Scruton’s comments saying they were simply “true”. In a Spectator column, Mr Murray accused Mr Eaton of “journalistic dishonesty”. He added: “Obviously since the British Labour party became a party of anti-Semites it has become exceptionally important to pretend that anti-Semitism is equally prevalent on the political right in Britain and that to criticise any of the actions of George Soros is in fact simply to indulge in anti-Semitism equivalent to that rolling through the Labour party. Watch: Toby Young discussing Sir Roger's sacking with Julia Hartley-Brewer. Toby Young, who resigned from an advisory role to the Department of Education last year after backlash over some of his twitter posts, told talkRADIO’s Julia Hartley-Brewer that Sir Roger’s words had been “misrepresented”. He added: “None of these opinions are relevant when it comes to accessing his credentials to do this particular job that he had been appointed to do. “Last November it was encouraging that the government stood up to the mob, despite of the efforts of the offence archaeologists who are digging down into people’s social media history. “But now four months later, a journalist deliberately sets out to get someone fired and misrepresents what they said in the interview.